Transit oriented development is all the rage in urban planning these days. Proponents claim new transit coupled with mixed-use zoning will ignite growth in otherwise struggling areas. Detractors claim running new lines to low-density neighborhoods will leave cities burdened with white elephants. Overall, reality is probably somewhere in between, but transit and population density is a real chicken-or-the-egg problem. Which comes first? Greater London is perhaps the perfect region to explore this question. Home to the world’s first metro system, London was also one of the first cities to explore transit oriented development. The Metropolitan Railway (the Underground’s former name) had the authority to coordinate rail lines with housing development, which it leveraged to the tune of 15,000 houses on 2,200 acres. It also built lines to serve neighborhoods already teeming with people. But the Metropolitan Railway did not have a monopoly on rail transport between London and the suburbs. Other companies both served existing towns and built new lines to otherwise underpopulated regions. Some teamed up with developers in the hopes of ensuring a steady stream of riders. Others lines were purely speculative, with owners hoping that development would follow. Fortunately for the Metropolitan Railway and other companies, the majority of speculative rail lines were successful in spurring growth, according to a 2007 research paper. The study examined two hypotheses: One, that transit oriented development works, and two, that transit follows population density. Both proved to be true. The paper’s author found that population density was driven by the presence of train stations, and that the presence of train stations could be explained by population density. For each one percent increase in rail capacity, population density increased nearly a quarter of a percent. And each one percent increase in population density over ten years leads to about a one quarter percent increase in train station density. “Train service led to a suburbanization of countryside and increased population of new developments, which attracted more railways,” he wrote. Mass transit, at least in the case of rail, appears to both drive development and benefit from it. Furthermore, the study claims, the Underground has helped build London’s city center into the commercial powerhouse it is today by fostering commuting from the city’s periphery. With more people commuting from the suburbs, commercial space could expand within the city center. And as people moved out of the city center, the sorts of traffic the Underground carried began to change too, adding more business-to-business traffic than before. 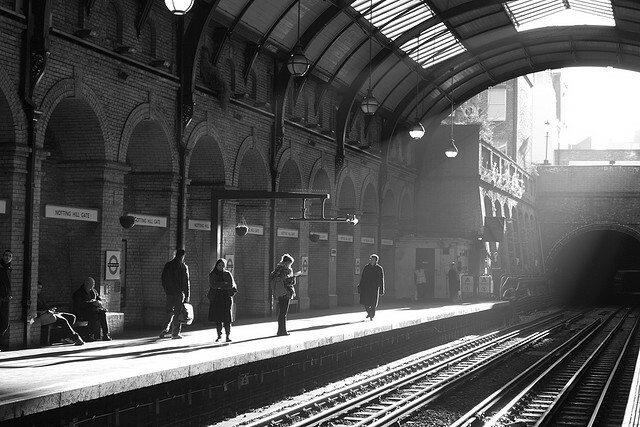 The shifting uses of the London Underground can also inform future transit planning. Building systems to merely serve existing commuting traffic will likely result in an overburdened system.